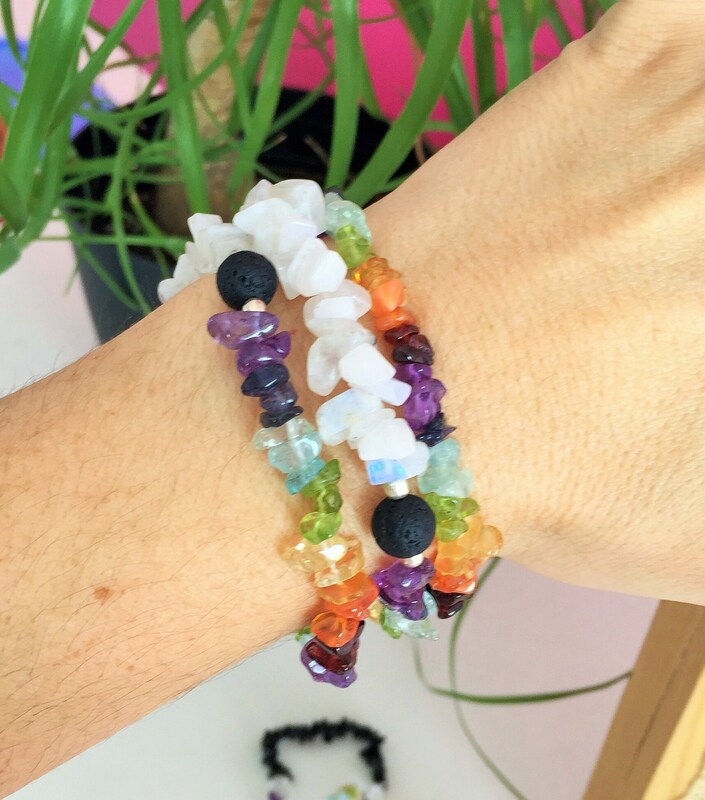 These beautiful High Quality Chakra Crystal Healing bracelets are handmade made with strong elastic stretch cord. 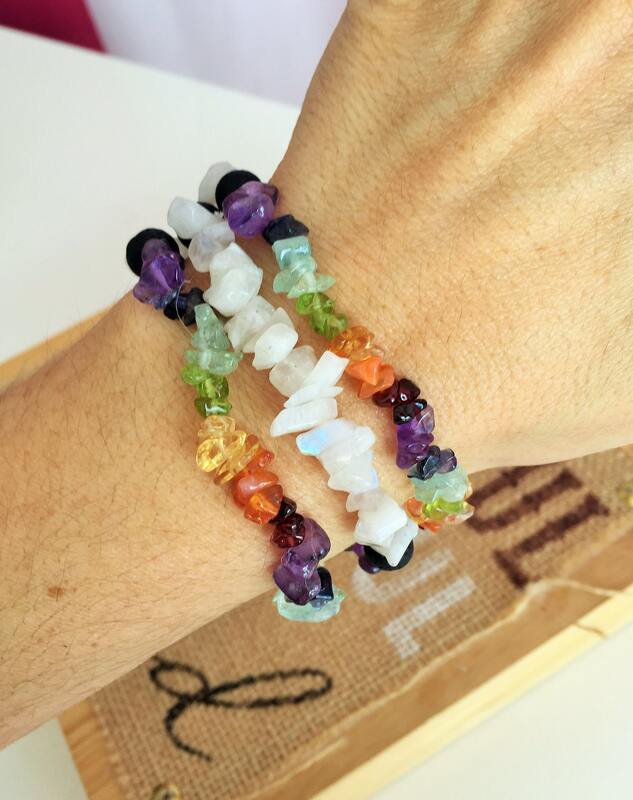 Bracelets come with moonstone chips together with the chakra rainbow color chips as seen in the pictures. 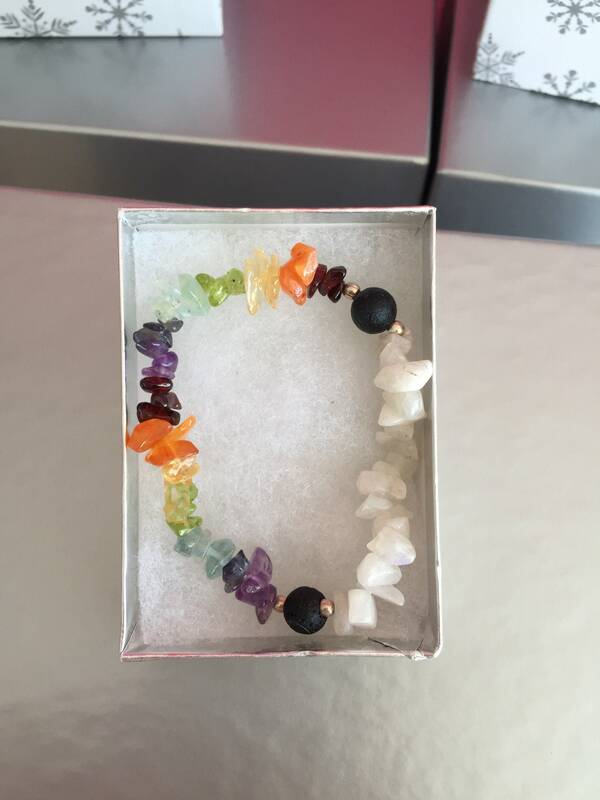 There are two round lava beads separating the chakra chips stones from the moonstone on the bracelet. The bracelets come on a stretchy cord making them one size fits most. Listing includes ONE Bracelet. Due to its elasticity, will fit all wrist sizes 6 - 8 inches. Amethyst - Activates spiritual awareness & wisdom. Possesses strong healing & cleansing powers. Moonstone are considered a sign of hope. A symbol for bridging the gap between your ego-self and your true self or your unconscious. It is a symbol of happiness. These stones have often been associated with the higher or Crown and Brow Chakra. They assist in visualization, imagination, dreams, and the power of healing. They are efficient as they can easily absorb and store our emotions and thoughts. Rainbow Moonstone is a stone of inspiration which enhances the imagination and creativity as well. It helps one release inhibitions and enhances the memory. ♥ All Bracelets have been cleansed with sage & charged with Reiki. Bracelet sizes: Some pieces appear larger in photos than actual size. Please note that: Average woman's size is 7" and average male size 8". If unsure, please measure your wrist with a string and a ruler OR with a measuring tape. Take that number and add about 0.5 - 1 inch for a perfect, comfortable fit. (Not tight, not too loose). This was also intended to go to my daughter,She has been wearing it. I absolutely love this bracelet!! The stones are full of color and I feel a little better just having it on....think I need to get another one to feel even better!! Will be buying from this shop again!! Thank you so much! !